How many artists or bands have the distinction of having four consecutive triple platinum albums? Very few. 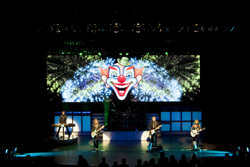 Styx was the first rock band to achieve this during the high flying, long playing record sales era of the latter ‘70’s. ‘78 was the peak year for sales since the invention of the LP in ‘48. So why not take two of their records from those glory years, ‘77’s The Grand Illusion and its follow up, ‘78’s Pieces Of Eight, and perform them live, back to back, both in their entirety and song order? (With a twenty minute intermission between sets.) That’s indeed what Styx is doing on their current U.S. tour. Hits and favorites like “Come Sail Away,” “Renegade,” “Blue Collar Man” and “Fooling Yourself (The Angry Young Man)” were all on display. Also on hand was a technically savvy show. Their stage is modern, sleek and smart looking. Mini, metallic staircases on either side of the drum riser adds a nice flourish. So do the formidable walls of amps at each end that change colors. The lighting is excellent, as is the sound quality. This is greatly enhanced by the stellar acoustics of one of the most treasured venues in the country, the gorgeous Beacon Theater. This Spanish Gothic style, 3,154 seat hall, originally a movie house, opened in ‘29. After many ups and downs over the decades, it has enjoyed a hefty $16 million restoration by its owner, Madison Square Garden, starting in ‘06. It was a seven month long process, and has returned it to its original, grand luster. It’s such a pleasure to see a show there, and it’s ironic that Styx’s best selling record, ‘81’s Paradise Theater, was about a once glorious, old time Chicago theater much like the Beacon that had fallen into complete shambles. For me, the coolest aesthetic feature of the show is a screen behind the band that has many clever images. Clowns, rolling dice, a sunset, horses, the old West, distorted band members, the Statue Of Liberty, a carnival, spiders, slot machines, X rays, playing cards, fire, pennies, female silhouettes and swirling colors comprise many of the varying themes. Musically, they sounded both superb and very tight. I especially enjoyed the playing of guitarist Tommy Shaw and drummer Todd Sucherman, who replaced founding drummer John Panozzo. Sadly, Panozzo passed away from a hemorrhaged gastrointestinal tract in ‘96. His twin brother, Chuck, is the original bassist. As kids they both founded the group, then called The Tradewinds, way back in ‘61 on the south side of Chicago. Chuck is now a part time touring member, and made several appearances during this performance. That’s to be expected at a show in the country’s premier market. The rest of the time it’s been Ricky Phillips on the bass, who joined the band in ‘03 when Chuck left due to his own health issues. Phillips can also play guitar, and often does so when Chuck is on stage. The only full time original member from their time as Styx, which they changed from TWF (Trade Winds Four) in ‘72 is guitarist and vocalist James “JY” Young, who joined in ‘70. The Panozzo’s and their neighbor Dennis DeYoung were the initial three to form the initial core of what would become Styx. Young would make it four. Very ably singing the songs of DeYoung is keyboardist Lawrence Gowan, who joined in ‘99 after musical and personality clashes forced a parting with DeYoung. Gowan is a strong performer visually as well, as is all the band. Movement and showmanship is quite apparent with these guys, despite them being in their 50’s. Shaw moves around the most, and has a confident and appealing presence. His youthful good looks has always been an asset to the group since he joined in ‘75, in terms of attracting female fans. Most importantly, he can sing very well and is a strong songwriter. All this combined with his stellar guitar playing makes him a quadruple threat. All in all, this band puts on a great show, has the chops to deliver with the best of them, and has a major fan base to draw from. They can play around the world, and do. They’re in an enviable position 38 years after they changed their name to the short and simple Styx. Its meaning is rooted in ancient Greek mythology, and is a river in Hades across which Charon carried dead souls. For this veteran band, going with the flow of their immense success is something they’ve certainly earned. Here’s to them traveling uncharted waters somewhere way out in the great, wide yonder.